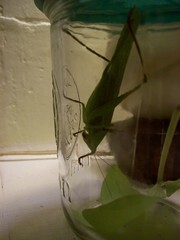 a bit like this grasshopper who showed up in my living room last night. We put him in my sprouter to see what he did. Grasshoppers are the most fastidious little creatures I've ever seen. I was mesmerized last night, watching him groom himself for well over an hour. He went to Pre-K today. We'll let him out this afternoon. Entomology is fascinating to me, and I love most insects, as long as they aren't "eww" bugs. Ladybugs, bees, beetles, wasps, even are fascinating. I love caterpillars, earthworms, crickets, too. Roaches? Eww. That's where I draw the line. This week I start museum-teaching, so I've been doing a lot of prep-work for my classes. Dear Gary has arranged to pick up little boy from his accelerated pre-K program (it lets out at lunchtime) so that I can keep Tuesday and Thursday as dedicated pottery days while I'm teaching. I'm really gearing up for holiday production. And to finally meet my summer obligations that fell by the wayside. It's a rainy cool Tuesday here- a pot of soup is on the stove, after-school muffins in the oven, and more prep and pottery fills my brain. Onward!